'The Villa Blue', the Russell Steenback Carter estate designed by Albro & Lindeberg c. 1910 in Hewlett Bay Park. 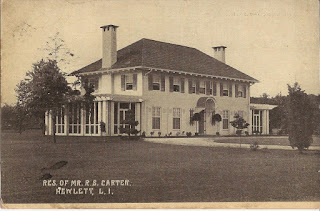 Carter was assistant manager of the New York Office of Ingersoll-Rand Company. Click HERE to see the residence on bing as it appears today following alterations. Lewis Colt Albro, Lindeberg's partner, came from Pittsfield, Mass., and made good in New York having found an opening at "McKim, Mead and White," in Stanford White's personal office. Albro was put in charge of the design and construction of Charles Dana Gibson's house being built at 127 East 73rd. Street. Albro took a shine to Gibson's young sister, Josephine, remaining close friends until his death.